(SEOUL, PROSTEMICS=April. 09. 2018.) Prostemics(KOSDAQ-203690) found for the first time in the world as a company that a specific microRNA in exosome, intercellular signal messenger, derived from human adipose stem cell conditioned media (ASC-CM) inhibits the initiation and progression of cancer stem cells. Prostemics confirmed the clinical value of stem-cell-derived exosomes in 2013 and has been working on the research and development of their functions and uses ever since. The study with KIST was published in the current issue of ‘Stem Cells international’, an ‘SCI-E’ international journal. Paying attention to unlimited proliferation of cancer cells, academia has been actively studying cancer stem cells to inhibit tumor growth. In this study, Prostemics administered the microRNA to immunodeficient mice that had been implanted with breast cancer cells. 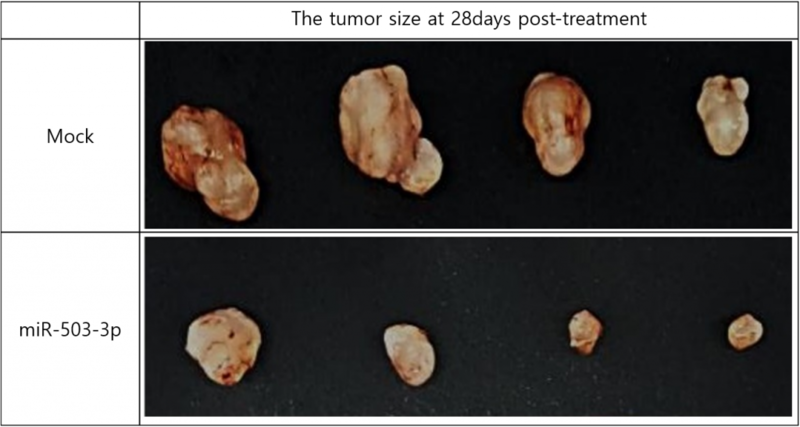 The result showed that the tumor growth was reduced to about 30%. Additionally, the microRNA was observed to affect ▶ cancer cell death, ▶ suppression of cancer stem cell’s proliferation, and ▶ down-regulation of a gene needed to keep the stemness of cancer stem cells. Besides, Prostemics is researching on melanoma, the type of cancer known to have the highest proportion of CSCs. The market size of melanoma treatment was estimated to be $3.3bn across the seven major markets in 2016 and is expected to reach $5.5bn in 2026, at a compound annual growth rate of 5.3%, according to GlobalData.